Birthday & Wedding Cake Delicious! Piece A Cake Bakery, established in 2005, provides unique, beautiful, and delicious confection with special attention to making it ”Just Right” for your bridal shower, wedding, birthday, baby shower, or any special occasion. This white wedding tier design was butter pecan with cream cheese, strawberry with butter cream, and marble with raspberry filling. Yummy! We offer several decorating resources like how to make a wedding cake and how to make fondant free for all of our visitors. Send us an e-mail here, or just take a look around! 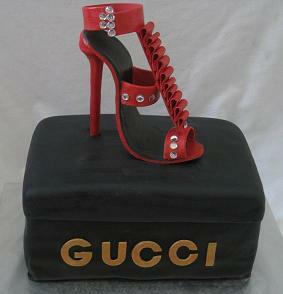 Yes, you can eat this Gucci shoe! We are located in Raleigh and deliver and serve the surrounding North Carolina towns of Raleigh, Apex, Cary, Fuquay-Varina, Pittsboro, Chapel Hill, Sanford, Durham, Garner, Wake Forest, all of Wake County and growing! The first section of our site changes weekly. It is our Just Made These and reflects the diversity of designs with pictures of our creations just made. It’s different each week so take a look at what we just made and come back next week to see the new ones. 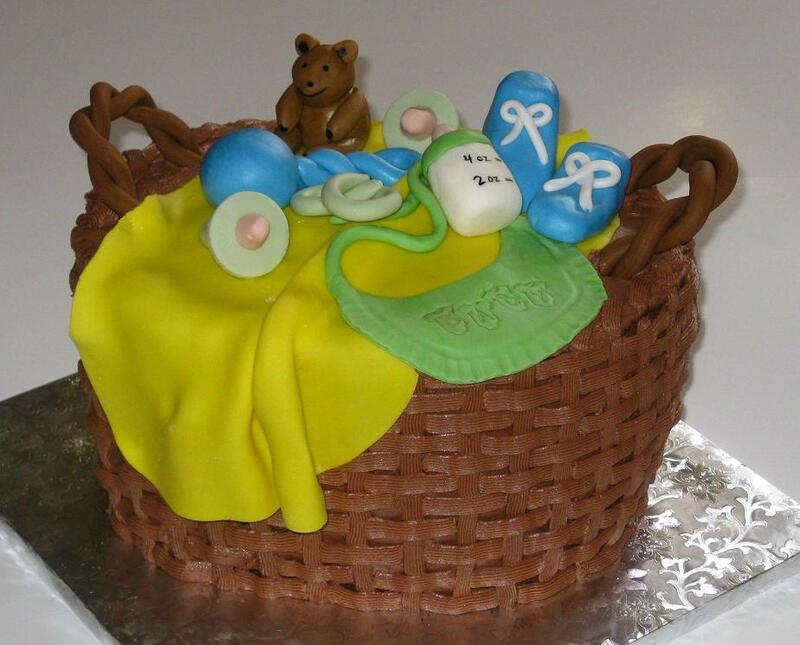 This basket design is a great baby shower idea. 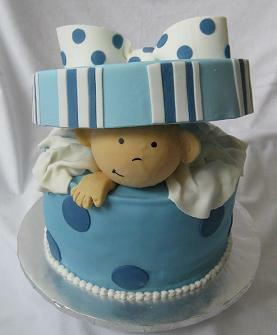 Our baby shower designs have been one of our most talked about specialties. Our Baby Shower Sweets are made for that special mom to be. We will help you to make the expectant mother feel special with a unique design "just for her". Send us your invitation, colors, theme, and flavors for a design idea. 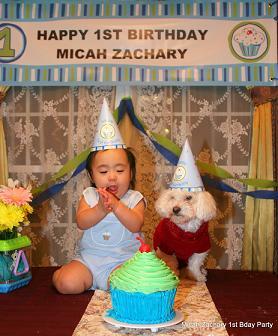 See our Picture Of The Week Here! 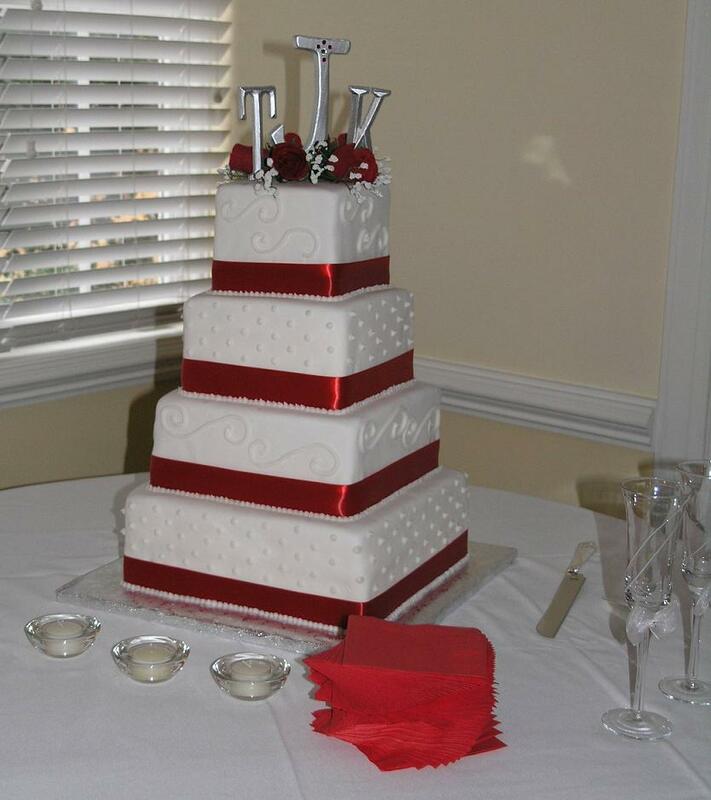 We believe that your wedding cake should be the centerpiece of the reception and should reflect the theme and mood of your special day. We provide a variety of shapes and sizes to accommodate any size wedding, as well as, the most stunning wedding centerpieces Raleigh has ever seen. Whether you are looking for the square design, the Topsy, a delightful butter-cream with frosting flowers or the fondant style with fondant ribbon, bows or flowers all are lovingly made unique for your special occasion, just for you! All available with a variety of flavors and fillings. 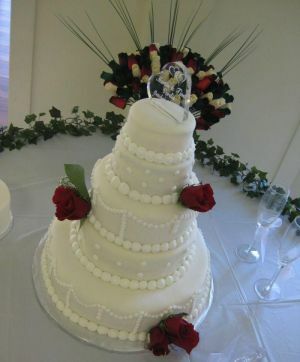 When deciding on a cake for a wedding, birthday or special event there are many choices and decisions. E-mail Steph to schedule your free tasting and experience for yourself the best tasting sweets in Raleigh and discuss your design ideas. This unique wedding centerpiece was designed using the latest in design software. We help you to create the perfect design unique for that special person. Our delicious products are made fresh, artistic, and elegantly designed for weddings, anniversaries, birthdays, bridal showers, baby showers, and any type of special occasion. Guests will remember your unique design as a special touch you provided at your event. We offer a variety of wedding stands. Birthdays are a special time and we design custom birthday confection uniquely matched to the style and personality of the one celebrating their birthday! Visit our Customer Reviews section to hear from our many satisfied clients. We guarantee your satisfaction and promise to make that someone special feel like someone special. If you are not satisfied with our service for any reason your next one is free! Be sure to ask for this from whichever bakery you choose. "Thank you so much for your business. Have a blessed day" Stephanie. 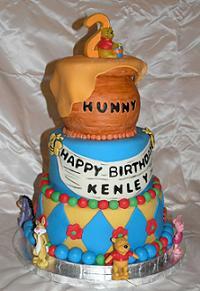 We also specialize in themes for any occasion like this Winnie the Pooh design. Take a look at some of our Birthday Theme Ideas. Let us help by presenting all of the options to you and help build that perfect design, just like you have dreamed of, special and unique. 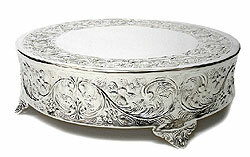 Our specialty is preparing a unique design that is reflective of the person and event. Give that special person a one of a kind. 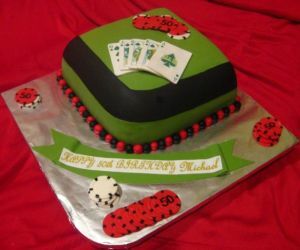 Sports fans will enjoy their favorite team or sport uniquely designed into a one-of-a-kind birthday or groom’s sweet made special just for them like this golf design. This custom poker theme design with cheesecake mousse filling was the perfect sweet ordered special by Michelle of Raleigh for her husband’s 50th birthday. Give yourself or someone special a sweet design to remember forever! Visit our Sports Theme Ideas and see custom designs made just for the sports fan. Your guests will enjoy a beautifully decorated product made with only the finest and freshest ingredients including real eggs and pure vanilla extract. 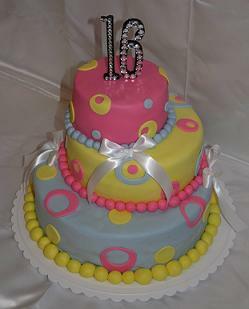 This sweet 16 birthday design was first covered with butter cream icing then with our special marshmallow fondant. Have you tried our special hand made marshmallow fondant? If not, put this on your bucket list. Our clients tell us that it's delicious! 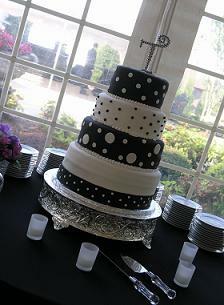 See our sweet 16 birthday designs here. We never compromise quality and give special attention to detail, making that perfect sweet idea to match our clients' desires. Each of our unique items are made with generous amounts of time, effort, and love. Combining these elements with our fresh ingredients will give you edible perfection. Each month we choose our favorite creations made and email them to our e-zine subscribers. It’s free and has some really cool pictures, instructions, tips, and design ideas. We invite you to join our pictures e-zine here. Here’s a chocolate strawberry lovers dream. 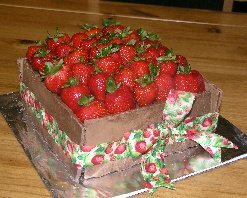 This chocolate box filled with chocolate cake and fresh strawberries makes a wonderful surprise. E-mail Steph and let us get started on your special idea! Piece A Cake delivers beautiful custom and delicious wedding cakes to the Raleigh area. View pictures and videos. Birthday cakes for your party see pictures, ideas, and recipes. Sports cakes fans will enjoy their favorite sport uniquely designed into a one-of-a-kind birthday or grooms cake made special just for them. See custom baptism cake pictures delivered to all of Raleigh, Cary, Apex, and more. Special event cakes made for the Raleigh, Cary, Apex, Holly Springs, Fuquay Varina, Morrisville, Wake Forrest and surrounding areas. 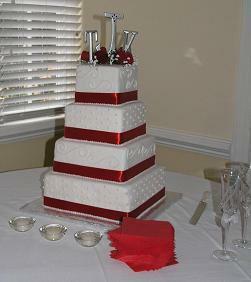 2008 Piece A Cake prices in Raleigh, Fuquay Varina, Holly Springs, Chapel Hill, Sanford and all of Wake County.. The Freshield cake storage container is a vacuum food storage container that keeps food fresh up to 5 times longer than conventional food storage methods. 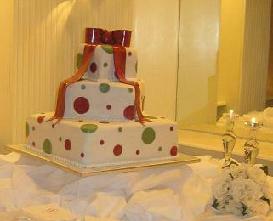 50th Anniversary cakes ideas and pictures to celebrate love with sweet confection. The Piece A Cake Blog keeps you up-to-date with all additions and changes to the Piece-A-Cake.com Web site. Subscribe here.